Albuquerque, New Mexico. 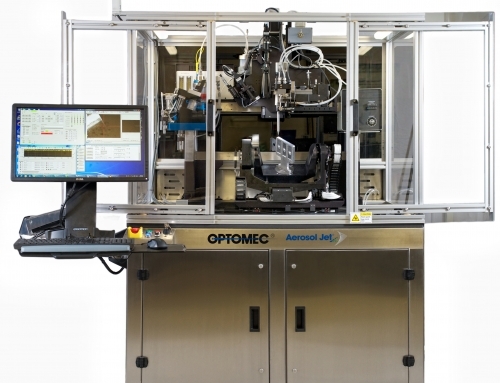 28 April, 2015: Optomec, a global supplier of 3D Printing systems for production applications, announced today that the Mike O’Reilly, Director- Aerosol Jet Product Management will present at the IDTechEx Printed Electronics Europe Conference this week. Mr. O’Reilly’s presentation, titled “Micrometer-scale 3D Printing with Aerosol Jet” will focus on unique capabilities of Aerosol Jet 3D technology that enable fabrication of hybrid electro-mechanical 3D structures. The IDTechEx Conference will be held in Berlin, Germany on April 28-29. Mr. O’Reilly’s presentation in the “3D Printed Electronics Track” will discuss how UV light exposure during printing can substantially cure polymeric materials in-flight, allowing structures to be built up in three dimensions. Aspect ratios of more than 20:1 are achieved with micrometer-scale posts, cylinders, and cones. With robotic manipulation of the print head and target substrate, the 3D features can be fabricated in nearly any orientation including the fabrication of hollow structures such as microbubbles. By co-depositing electronic and polymeric materials it is possible to fabricate hybrid structures. In this case the polymeric materials serve as the mechanical support for nano-metal conductors and other electronic materials. Mr. O’Reilly will also provide an overview of the company’s family of Aerosol Jet Printers, which are used to directly print functional electronic circuitry and components onto low-temperature, non-planar substrates, without the need for masks, screens, or plating. The company’s newest printer- the Aerosol Jet 5X system, is specifically for printing conformal electronics onto 3D structures. The new system delivers the precision and flexibility required to produce high resolution 3D printed electronic devices such as conformal antennas, sensors, and other components for applications in consumer electronics, automotive, aerospace and the Internet of Things. For more information on Aerosol Jet printing, click here. LENS is a registered trademark of Sandia National Laboratories. Aerosol Jet and Optomec are registered trademarks of Optomec, Inc.